Coca-Cola Vanilla is better IMO. My circle pad is a stub but I still seem to play good at the game. Tilts are easier to pull off imo. It was always going to get into that kind of territory so I'm not suprised. The Nintendo Direct was so amazing, the people here are in too much awe to say anything! Battle Circuit and Armored Warrior on consoles for the first time is pretty cool! Toadette's ability is to turn into Peach? Why not just have playable Peach? It's really unfortunate what's been happening with the natural disasters in Japan but what I find even more appalling is how entitled some people are acting over the Nintendo Direct. To be honest I'm really to the point where I think we don't need to hang a spotlight over the most degenerate reactions to everything. We know they exist. It's a bit sad that we've gotten to that point but you're right. It's horrible that some people are acting that way, but to be fair, they're such a tiny, tiny percentage of Nintendo fans that I'm not gonna read too much into it. I mean, you can always find at least one utter jackass online, regardless of what happens or what's being discussed at the time. Best not to give them much attention, or make a mountain out of a molehill by acting like one or two idiots represent a large group. - AND AN ASSIST TROPHY. And an apperance in Super Bomberman R.
I would have prefered Bomberman to be in Smash. There was an easter egg on the DS game, where Luigi ate a poisoned mushroom and dies. Coincidence? More like what didn't I do. remember the snoop-san doll? the NYEEEHHH NA NA NAA NAAA? So how long until this place dies again? Best not to ask, and just enjoy while it isn't. Gonna take a break from the forums until I can get my hands on the game lol. Spoilers don't really matter but still I'd like the game to be sort of fresh by the time I get my hands on it. tfw you spend an hour looking through someone's twitter for a specific retweet but the page gets too laggy. Thread archeology at its finest. sadly it's clear that Twitter isn't built for looking at the past. Is there a particular reason we're excited Gamer is back? I mean I'm not against it but it seems a bit superflous. It's still a different spin on the formula and the best part of Game & Wario. That and it fits with the Best of theme of Gold and makes for a nice bit of extra content outside of the main stages, which is especially nice to see after initial concerns on whether or not the game is going tp have much of that. I can see that. While the advertising or lack of is unfortunate, it seems they at least didn't get cheap and lazy with the game itself which is showing a nice amount of content for what it is. Because it's a neat concept that was sent to die in Game & Wario. Some may even call it the spiritual predecessor to the Five Nights at Freddy's series. Who are all these people who just show up without introducing themselves??? Well, I guess we'll have to see if that theory holds true. Mass posting anything that is NOT Ashley related? It's not so much the Ashley stuff that's making me raise an eyebrow but why is Kyon's stuff over represented? This isn't just me having a grudge against him. 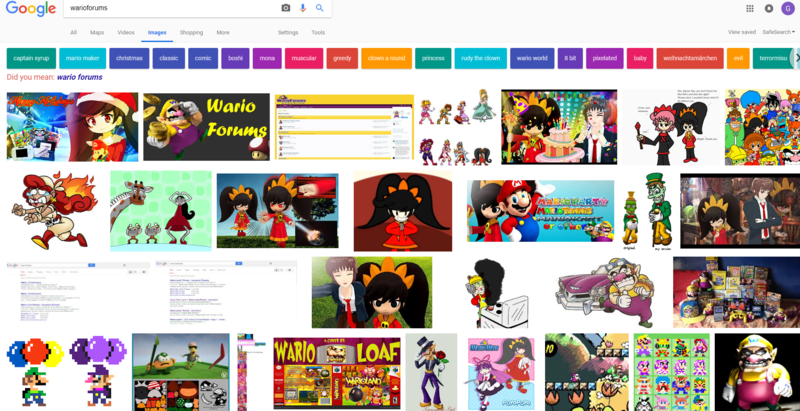 I know he has the second high post number on the forums but this is such a strange selection of images to show up as the top google images. You got Kyon's stuff and then random stuff like 9-Volt burning something on a stove top. Thankfully I haven't posted in awhile. Or this Kyon/Ashley problem would be even worse. Sometimes I wish we could invite Ko Takeuchi and see how he would react to our comments. Oh I don't have any ~solid proof~ but it's obvious he run searchs for warioware/RH and his characters based on how he RTs stuff and I wouldn't be surprised if he *didn't* find this forum at least once through google. I'm so tempted to send a link to the forum to him on Twitter and see if he responds/sees it.